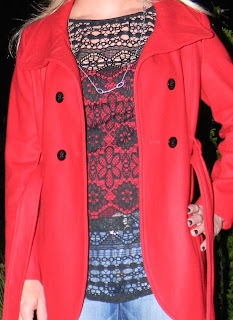 Unordinary Style: Outfit for 11/25/13 & My New Coat! That is a great coat/jacket that will go lots of places with looks ranging from very casual to somewhat more dressed. Thanks Pat. I too thought it would be a very versatile item. A gorgeous coat to add to your wardrobe, Nadine. It's funny that it happened to be from Guess, but what can a girl do, you love what you love. It goes very well with the black boots too! I'll have to check out the crossdressers.com forum this weekend and see what it's all about. I find the forum to be interesting in the amount of interaction available on it. Check it out.